Westlake – O Hei There! 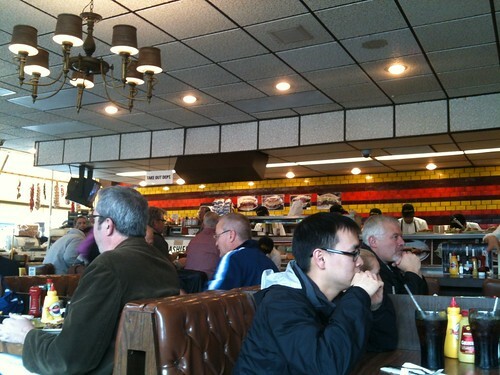 It embarrasses me to say this, but my visit to Langer’s in March was the first time I’ve eaten there. EVER. 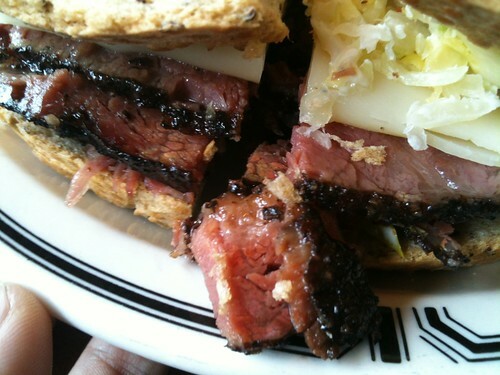 I’ve had their stuff via catering and to-go a long, long time ago, but never managed to dine in at the restaurant, nor order what they’re known for: the pastrami sandwich. I blame their hours – they’re only open until 4pm Mondays-Saturdays. Still, truly embarrassing for a LA native to have not visited what is arguably THE dining landmark in the city. And it’s not like it just slipped my mind, either. I hear their radio ads on 710 ESPN every damn day. 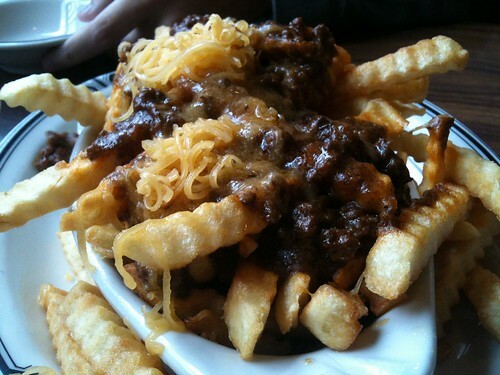 I forgot how it transpired, but one Saturday afternoon, Daniel, Kevin, and myself just decided to go to Langer’s. We had mentioned going there on multiple occasions, but the idea wasn’t really premeditated. Just one of those abstract ideas you throw out there and expect everyone to forget about it. But there we were, suddenly determined to follow through. We went shortly before the restaurant closed at 4pm (around 3pm I think), but there was still a line out the door. Luckily, we only had to wait a few minutes before being seated. My first thought: this place is much smaller than I envisioned. Guess that’s one reason why they’re always so busy. 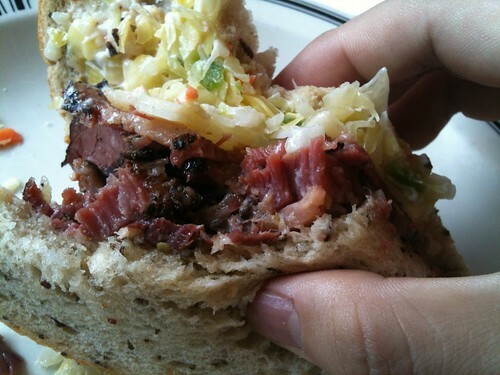 They are, after all, considered to be the best deli in town (or even the nation, according to some). 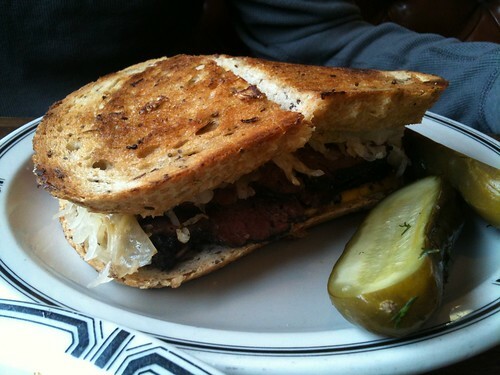 I got the #19, which is pastrami on rye with Swiss cheese, coleslaw, and Russian dressing (their most famous and popular item). 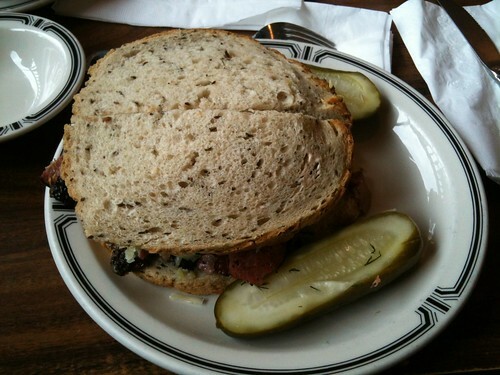 I’m ususally more of an old-fashioned person when it comes to my pastrami sandwich, which means just meat and bread, but everything just worked here. 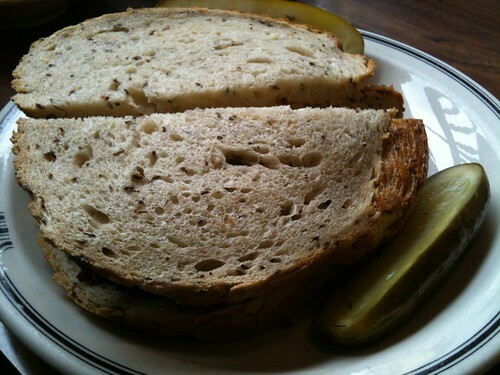 Of course, the highlights of the sandwich was still the meat and bread. I read, shortly after my visit, that neither the meat or bread is made in-house (which is understandable, seeing how big the place is). That might seem like a negative (certainly brought my pastrami high down a little), but after thinking about it, the key aspect here is really what Langer’s does with what they’re given. I mean, a prototype wide receiver in the NFL can be 6’5″ and run a 4.4 40-yard dash, but all of that means nothing if he can’t produce on the field. Langer’s is able to utilize those given gifts and generate maximum output. The Calvin Johnson of all delis. First of all, let’s talk about the meat. They’re thick-cut, fatty slices with a nice pepper crust. The meat itself is succulent and nicely seasoned, without being overly salty. There has to be a special way they’re steaming or preparing the pastrami, or else there would’ve been many imitators along the way. Then that rye bread, that pillow-soft bread with the crunchy crust. How do they manage such a perfect contrast? Double-baking, homie. Not a radically new concept, but one I’ve never seen utilized outside reading Yakitate!! Japan (manga about baking bread – don’t laugh at me, it’s good).